Special events are our specialty… high energy rock with a great horn section. We are a family friendly main stage act with amazing performers and lots of audience interaction. Formed in 2001 by Jim Miller, Dangerous Jim and The Slims have blistered the Midwest with a high energy high entertainment show like no other. Contact us to play at your event. Dangerous Jim & The Slims pay tribute to local rockers The Raisins covering their early 80’s hit Fear is never Boring. Al Green – Aerosmith – BB King – The Beatles – Beastie Boys – Bo Diddley – Bob Marley – Blood, Sweat and Tears – Blues Brothers – Bob Seger – Brian Setzer – The Cars – Cat Stevens – Chicago – The Commodores – Cream – Crosby, Stills, Nash and Young – David Bowie – Delbert McClinton – Electric Light Orchestra – Eric Clapton – Elvis Presley – Fabulous Thunderbirds – Frank Sinatra – Garth Brooks – Genesis – Grand Funk – Hank Williams Jr. and Sr. – James Brown – Jimmy Buffett – KC and The Sunshine Band – Kid Rock – Maroon 5 – No Doubt – Parliament – Funkadelic – Queen – Ray Charles – Red Hot Chili Peppers – Rolling Stones – Sammy Davis Jr. – Sammy Hagar – Stevie Ray Vaughn – Stevie Wonder – The Temptations – Thin Lizzy – Tom Jones – U2 – Willie Dixon – Wilson Pickett – ZZ Top PLUS MANY MORE!!! More Details on our Upcoming Show! 1. Performance and Interaction: Be honest. Have you ever hired a band whose demo sounded good, their promo materials were professional, then they proceeded to bore the heck out of your audience? That will never happen with DANGEROUS JIM AND THE SLIMS. We pride ourselves not only on being great PERFORMERS, but also great “INTERACTERS”. We’ll “MEET” your audience during the show, not just perform for them. We’ll interact with them between sets, pre-show and post-show. When they leave your event it will be with a smile on their face and a true appreciation of what a good live show is. 2. Experience with All Types of Audiences: We have played hundreds of concerts in the past six years, and, believe it or not, vocalist Dangerous Jim has played over 2000 shows in his career- all in the same boots!! The band has headlined RIVERFEST 6 times, an event that happens during Labor Day and draws over 500,000 people to each side of the OHIO RIVER. That is performing for at least 10,000 people during each RIVERFEST performance. We’ve performed at every major event in Cincinnati at least once during our career. We’ve performed pre-game concerts for both THE CINCINNATI REDS and THE CINCINNATI BENGALS. We played for only 8 people once because of inclement weather and we aren’t afraid to tell you. WE GAVE EVERYTHING WE HAD FOR THOSE 8 PEOPLE!! 3. Dance Moves and Choreography: We are all terrible dancers, but Dangerous Jim thinks he’s a good dancer. When you see him perform you’ll realize he is a terrible dancer who has fun trying. That’s what counts right? Occasionally and accidentally we’ll all do something similar at the same time – We call that choreography. 4. Musical Chops: Every member of DANGEROUS JIM AND THE SLIMS is an accomplished musician. The combined musical experience of the band is over 1000 years! (just checking to see if you are reading this). Vocalist Dangerous Jim has won 3 Cincinnati Area Music Awards, released 3 full length albums with his previous band Leap Skyward, and won the Motley Crue KICKSTART YOUR CAREER Contest. Shawn David Anderson is one of Cinci’s best guitar players and one of the most sought after teachers in the Midwest. Watch our video or go to www.shawndavidanderson.com for more info. 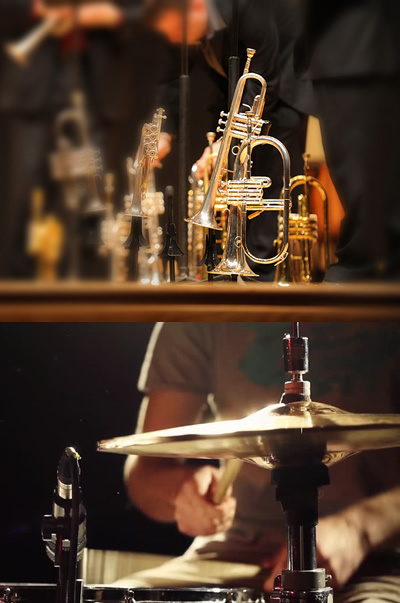 We also have a GREAT 3 – PIECE HORN SECTION!!! No lame sampled horns from us – We are the real deal. Our single “FOR ONCE IN MY LIFE” was included on the BUDWEISER 2005 TRUE MUSIC COMPILATION. promoting events we are involved in. about a Halloween – Themed show with a bunch of songs about monsters? A Valentine Dance with lots of love songs? We’re in. Just book us. 7. Self Promotion: Need we say more? 8. Kids Love Dangerous Jim: We come to every show armed with free stickers, lollipops, toys, squirt guns, and all types of other things that children love!! Of course we OK any free swag that we want to distribute with event promoter prior to our entertaining show. 9. Song Selection: We have TONS OF MATERIAL! Swing – Blues – Country – Rock – Oldies. You name it, we maim it! We always perform family – friendly, light – hearted songs with EVERYBODY in mind. Our experience in playing hundreds of shows in too many situations to list here gives us excellent intuition. Your mixed audience will love us. 10. We Love Entertaining: Read every interview Dangerous Jim has ever done. The recurring theme is that we love to make people smile. That’s what life is all about isn’t it? We might even entertain a jaded Festival Booking Agent! Make sure you come see us! 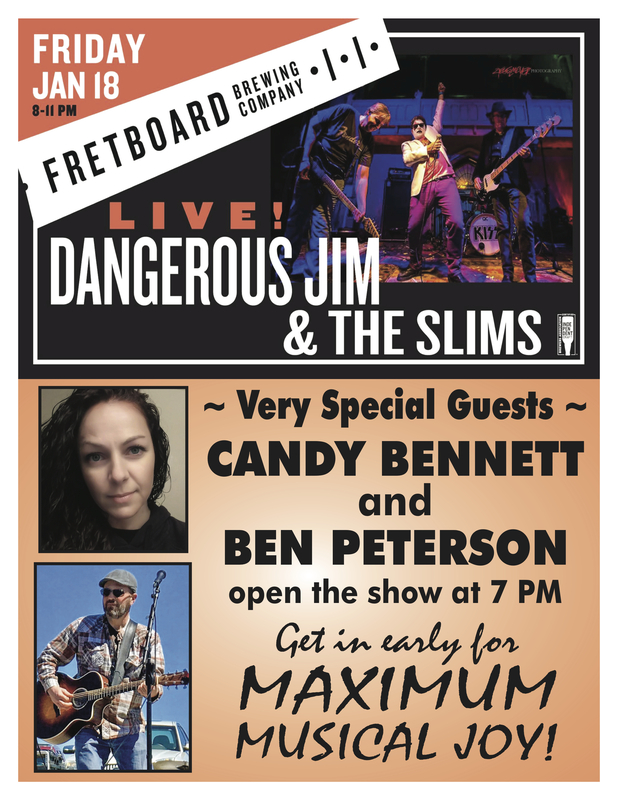 BOOK DANGEROUS JIM AND THE SLIMS FOR YOUR EVENT RIGHT NOW!! Contact us with questions or for information on booking your customized show today!